Sports Costs > How Much Does a Skateboard Cost? A skateboard, usually made from maple board with a polyurethane coating, is propelled when pushing one foot while leaving the other on the board. The price of one will depend on the type, brand, quality and where it’s being purchased from. 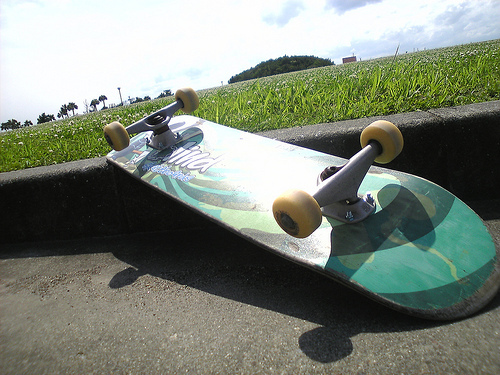 On average, a skateboard can vary anywhere from $20 to as much as $300 per board. We took a look at the most popular retailers that sell skateboards and included the price average inside the table below. A professional skateboard, similar to ones you see on TV and in professional tournaments, can run around $100 to $250. If the skateboard has to be customized, the price can increase substantially. A skateboard that includes no graphics can run $50 to $110. Considered a higher quality, skaters can add decals and their own graphics in the future, but most skateboards will come in one solid color. The only reason they are cheaper is that they lack the graphics; the quality may still be just as good. A mid-quality skateboard that is designed for newer skateboarders is going to be within the $40 to $65 range. This skateboard is not ideal for professional circuits, but good enough to get the job done. Skateboards designed for children often are the lowest in terms of price. These boards can range anywhere from $20 to $45. If you were to build your own skateboard, then plan on spending about $30 to $80 for the deck, $15 for the bearings, $35 for the trucks, $5 for the grip tape and another $30 or so for the wheels. For example, the highly rated Powell Golden Dragon skateboard retails for $50 to $75, while the PRO Skateboard Complete retails for $24 to $30. According to a Wikihow.com guide, a longboard can cost $120 to $500 while a classic board can cost upwards of $400. Members on Reddit.com discussed this question and stated you should be prepared to spend $120 for a quality board. A skateboard, when purchased from most retailers, will come with the deck, wheels and even graphics. Graphics can be optional, but if chosen, they will be embedded on the board. A skateboard deck will come in a variety of widths, including a full size (7.5-inches or larger), mid-size (7.3-inches), mini (7 inches) and micro (6.5 inches). A full size, for example, will be intended for those who are five feet or taller, whereas a mid-size will be designed for those in the 54 to 60-inch range. A shortboard will be the shortest type and will be designed more for getting air and performing tricks. A cruiser will have a kicktail, making it easy to maneuver throughout the streets, and will be designed to do just that — cruise around. An old-school board will have a flat nose, kicktails and will be asymmetrical with a wider nose than other types. This board sits lower to the ground with larger wheels and will the choice for those who want to ride ramps or pools. Lastly, a longboard will be just that — a longer-than-average skateboard. This board is designed for downhill racing due to its symmetrical shape. Adding graphics to an existing skateboard can cost $1 to $10 per decal. The price of a decal will depend on if you’re purchasing one in stock or need one customized. While optional, experts may recommend that you set aside a pair of shoes solely for skateboarding. A good pair of skateboarding shoes will cost around $50 to $100. If a skateboard deck is purchased on its own, wheels will be an additional cost to consider. Try your local skate shop as this will give you the opportunity to try the board in person. It is a great way to get a feel for the board. A board won’t be a board because sizes will vary. To save money, purchase a deck that has no graphics. Plain colored skateboards will cost a lot less than those with decals and graphics. Even if you find a skateboard with a nice graphic, keep in mind it will scratch up quite a bit as you ride it. If you’re serious about skating, professional skaters recommend going to a local skate shop to find a quality board. Cheaper skateboards, often found at your local retailers, will be made from a cheaper material and can break down quicker because of it. Hi, Im trying to sell my board, it has all parts, but the paint is chipped at the front and back, the sand paper is fine but has dirt (of course) wheels are fine, they roll good. How much should this be?